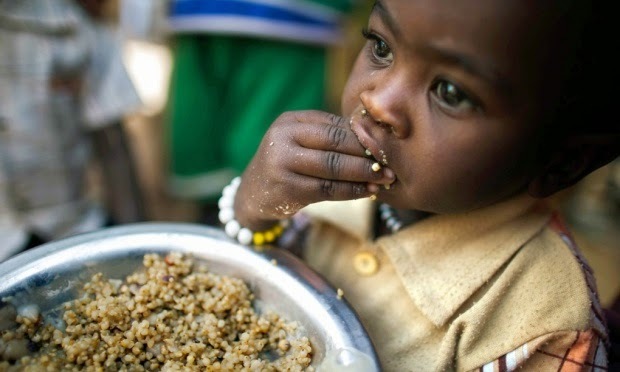 From The Guardian: What is the millennium development goal on poverty and hunger all about? This article from The Guardian does a wonderful job helping us understand the millennium development goal on poverty and hunger - the promise, the measurables, the results. What is the millennium development goal on poverty and hunger all about? The first MDG set out to halve 1990 poverty and hunger rates by the end of this year. As the deadline approaches, we look at what progress has been made. In 2000, world leaders set out to halve 1990 extreme poverty and hunger rates by the end of 2015. This means that the percentage of impoverished people – defined by the World Bank as those living on less than $1.25 (£0.83) a day – must fall to 25% by the end of this year, while the proportion of people without adequate food security must be reduced to 12.5%. Another target under MDG1 is to achieve full and productive employment and decent work for all the working-age population, including women and young people. The target to reduce extreme poverty by half was reached by 2010, when the global poverty rate dropped to 22%, making it one of the first targets across all the goals to be met. However, stark regional differences mean that while east and south-east Asia have met the target, sub-Saharan Africa is unlikely to do so. It’s uncertain if hunger will be halved by the end of this year. There are 805 million chronically undernourished people, down by more than 100 million in the past decade, according to the UN’s Food and Agriculture Organisation. In its most recent progress report (pdf), the UN said 14% of the world doesn’t have adequate access to food. The UN has complained that progress towards the target has slowed since 2005, cautioning that immediate additional action is needed to meet the goal. As for employment, the global economic crisis had a huge impact on labour markets, making the task of reducing the number of low-quality jobs even more difficult. This target is unlikely to be met. Women are still more likely to be working in low-quality jobs than men. How are hunger and poverty measured? Extreme poverty is measured by three indicators: the percentage of the population that lives on less than $1.25 a day; the number of people who live beneath the minimum income level deemed necessary to meet basic needs; and the share of national food consumption by the poorest 20% of the population. Poverty was first defined by the UN as anyone who earns less than $1 a day. This was revised to $1.25 a day to reflect rising commodity prices. The poverty line – a measure of the amount of money needed per day to survive – is dismissed by some as a poor way to calculate poverty. Critics say millions live very close to either side of the line, with not much difference in what they can afford. More broadly, the MDGs have been criticised for targeting a reduction in the proportion of people living in poverty, rather than the absolute number. Thomas Pogge, a professor in development studies at Yale University, said this could “paint far too rosy a picture of the evolution of extreme poverty” (pdf). Hunger is measured by the country average of how many calories each person has access to every day, as well as the prevalence of underweight children younger than five. Gaps in data gathering have cast doubts on the credibility of the UN’s figures in eradicating hunger and poverty, some experts say. They claim that more than 40 developing countries lack sufficient data to track performance in these areas. The global rate masks uneven regional progress in reducing hunger and poverty, critics say. For example, China’s successful poverty reduction strategy accounts for most of the world’s gains over the past 25 years. East Asia’s poverty rate tumbled from 80% in 1980 to 20% in 2005. But, “the world doesn’t have another China”, says Lawrence Haddad, a senior fellow at the Institute of Development Studies. By contrast, sub-Saharan Africa’s rate hovered around 50% over the same period. “The rate of poverty reduction has been much slower in low-income countries, especially in sub-Saharan Africa where the absolute number of poor has continued to increase,” according to the World Food Programme. Which issues weren’t adequately addressed in MDG1? Food waste, land rights, soil quality, obesity, access to nutritious food, overreliance on certain crops, genetic modification, price volatility, disaster preparedness, monitoring progress. How do the MDG1 targets translate into the SDGs? The sustainable development goals (SDGs), which come into effect in 2016, include a target to end poverty everywhere, and one to end hunger, achieve food security, improve nutrition and promote sustainable agriculture. There is a standalone target to promote sustainable economic growth, which includes full and productive employment, and decent work for all. Food for the Hungry: From The Guardian: What is the millennium development goal on poverty and hunger all about?